We teach classical Japanese kobudo (old style martial arts) in Dublin. 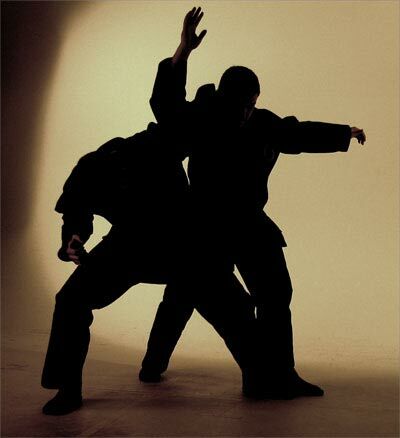 Specifically, the focus of our school is the transmission of the martial arts taught by the Bujinkan Dojo in Japan. This includes the study of nine feudal-era samurai ryuha such as Togakure Ryu, Takagi Yoshin Ryu, Kukishin Ryu, Gyokko Ryu, Koto Ryu and more. The formal name of this art is Bujinkan Dojo Budo Taijutsu, but it is sometimes referred to as Ninpo Taijutsu or just ninjutsu, in reference to the ninja-related aspects of some of the ryuha. At the Bujinkan Nami Ryu Dojo in Harold's Cross, we pride ourselves on our attention to detail, our focus on the kihon waza (basics) as a route to higher skill and in our ability to create a relaxed and enjoyable training environment in which any dedicated person can grow and thrive. The dojo was founded as the Bujinkan Meehan Dojo in Trinity College Dublin in 1998, changing its name to Bujinkan Namiryu Dojo in 2011. It is currently located in Harold’s Cross, Dublin. The teacher is Alex Meehan, a licensed shidoshi, or instructor of the Bujinkan Dōjō. A journalist and author by profession, Alex started training in Bujinkan Ninpō Taijutsu in 1989 and was awarded a teaching license in 2000 by Hatsumi Masaaki, Sōke of the Bujinkan Dōjō, the rank of Judan Kugyo in Tokyo in 2009 and the title Yushu Shihan in 2015. He is also the recipient of various honours from the Bujinkan Hombu Dojo, or headquarters, including the Golden Dragon award and the Bufu Ikkan Shingitai Ichi Sho certificate. Dojo members visit Japan two to three times each year to study with Hatsumi Masaaki Soke and his senior shihan teachers in Tokyo. We are a non-commercial martial arts school. Profits are spent on improving the training facility and improving the quality of tuition offered. Training is currently held on Mondays at 7:30pm, Thursdays at 7:30pm and Saturday morning at 11am. Classes last 1.5 hours. In addition to these costs, we also levy a yearly membership fee of €50 which covers insurance costs and membership to the Bujinkan Dojo organisation in Japan. This is payable in January every year. New students are not expected to pay this fee until the start of the first full calendar year that they are training. As we are one of the few martial arts clubs in Dublin to have its own full-time facility, complete with the costs that go with that, we ask that students pay by the month in advance by standing order or Paypal subscription. The dojo is located upstairs at 19 Greenmount Lane, Harold’s Cross, Dublin 6. Although the entrance to the dojo is on Greenmount Lane, the premises is part of the Greenmount Industrial Estate complex and there is ample free parking in the estate for anyone coming by car. We have classes three times a week, on Mondays, Thursdays and Saturday. We also have a monthly workshop, generally on the first Saturday of the month, that lasts a full day. There are occasional seminars with visiting teachers and these generally get announced on our Facebook events page. Classes can be watched by appointment. All you need to do is get in touch via e-mail and ask about watching a session. We ask that during these sessions, you refrain from taking pictures or videos, and turn your phones to silent. Classes last an hour and half, but there is generally a break half way through, and at this point you can ask questions or leave if you need to. What is the ‘Bujinkan Dojo’? What does ‘Budo Taijutsu’ mean? What about ‘Ninpo Taijutsu’? ‘Budo’ means ‘Martial path or way’ and ‘Taijutsu’ means ‘body methods.’ Taken together, ‘Budo Taijutsu’ means ‘Martial arts of using the body.’ The Budo Taijutsu studied in the Bujinkan Dojo encompasses lots of different kinds of Japanese martial arts and the term Budo Taijutsu is used to refer to all of them. ‘Ninpo Taijutsu’ is another name for the martial arts we study. ‘Ninpo’ means ‘perseverance method’ and is a term used to describe the approach to martial arts used by ninja. What does ‘Nami Ryu’ mean? Nami Ryu is the bugo, or martial arts name, given to Alex Meehan by Hatsumi Soke. It means ‘wave dragon.’ Many of Hatsumi Sensei’s senior students have such names – they are only used in connection with the administrative functions of the dojo. What kind of martial art is Budo Taijutsu? What do you practice? Taijutsu (unarmed fighing) makes up the majority of the material studied, as the weapon and ancillary arts all strongly relate to taijutsu. How is this material taught? Does the training include kata or forms, as in other Japanese martial arts? Kata form an important part of the Bujinkan martial arts, but not in the way most people would understand. In traditional Japanese martial arts with older roots, such as ours, kata are generally performed by two (or more) partners and are quite brief, reflecting the reality of combat encounters. They are rarely if ever performed solo (as is common in other arts) and they teach the art's basic concepts: typical attacks and common ways of dealing with them.